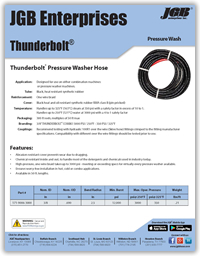 Thunderbolt® Hose - JGB Private Brand - Hose by Vendor - JGB Enterprises, Inc. Designed for use on either combination machines or pressure washer machines. Handles up to 325°F (163°C) steam at 350 psi with a safety factor in excess of 10 to 1. Handles up to 250°F (121°C) water at 3000 psi with a 4 to 1 safety factor. Recommend testing with hydraulic 100R1 over the wire (Skive hose) fittings crimped to the fitting manufacturer specifications. Compatibility with different over the wire fittings should be tested prior to use.